The preceding chapters of this book have covered the steps necessary to configure an environment suitable for the development of Android applications. Before moving on to slightly more advanced topics, now is a good time to validate that all of the required development packages are installed and functioning correctly. The best way to achieve this goal is to create a simple Android application, compile it and then run it within an Android Virtual Device (AVD) emulator. The first step in the application development process is to create a new project within the Eclipse IDE. 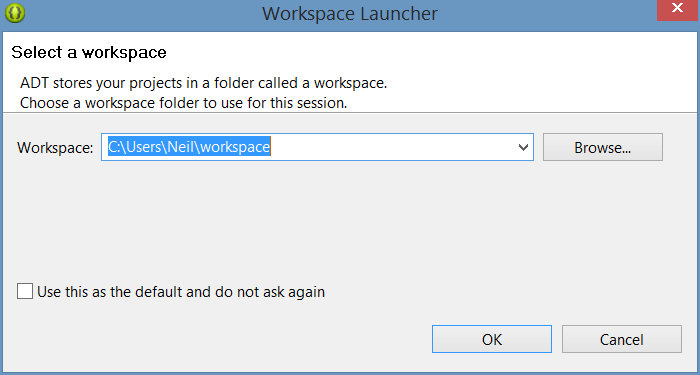 Begin, therefore, by launching Eclipse and accepting the default path to your workspace in the Workspace Launcher dialog as illustrated in Figure 4-1 (or choose another location if the default is unsuitable). Note that if you do not wish to be prompted for the location of the workspace each time Eclipse loads, simply select the Use this as the default and do not ask again option before clicking on OK.
Once the workspace has been selected, the main Eclipse workbench window will appear ready for a new project to be created. 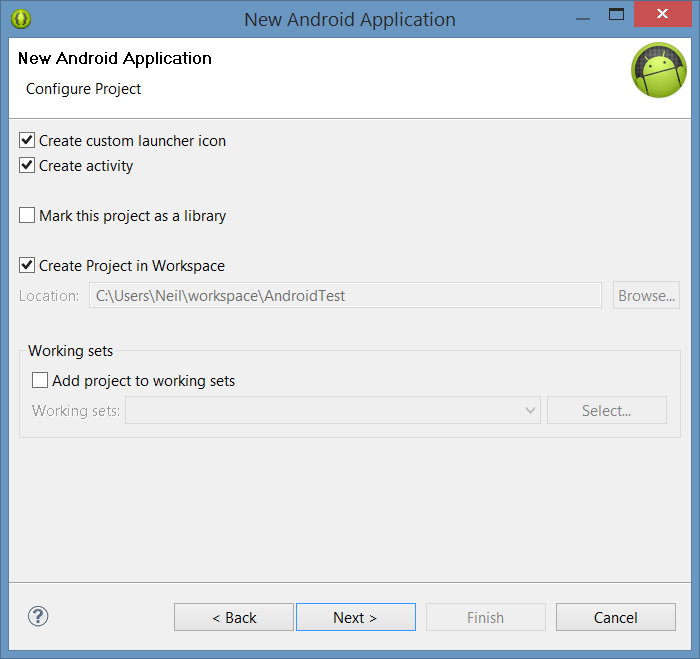 To create the new project, select the File -> New -> Android Application Project menu option. 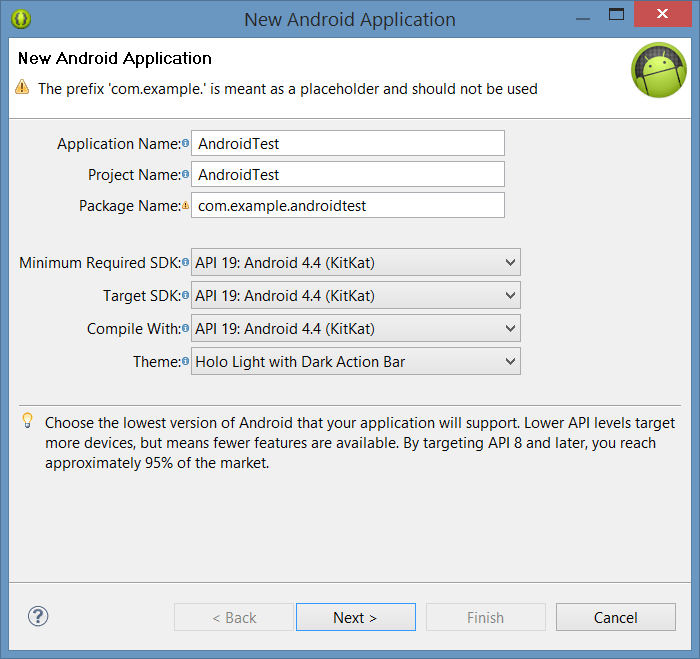 In the New Android Project window set both the Application Name and Project Name to AndroidTest. With the correct settings configured, click Next > to proceed to the Configure Project screen (Figure 4 3). Within this screen, a number of different configuration options are provided. Make sure that the Create Activity and Create customer launcher icon options are selected. The former setting will ensure that the project is preconfigured with a template activity that will make the task of creating an example application easier. An activity is a single task that can be performed by the user within the context of an application and is typically analogous to a single user interface screen within an application. In asking for Eclipse to create an activity for us, therefore, the project will be primed with both a window onto which a user interface may be displayed and the code to ensure that the window appears when the application runs. The custom launcher selection, on the other hand, will provide the option to specify the icon that will represent the application on the device screen. Clicking the Next > button will proceed to the launcher icon configuration screen. Before the application can be submitted to the Google Play app store for sale it will need to have an icon associated with it. This icon is displayed on the screen of the Android device and is touched by the user to launch the application. The launch icon can take the form of a set of PNG image files, clipart or even text. Options are also provided on this screen to configure the background color of the launcher and to change the shape surrounding the icon. Click Next > to proceed with the configuration process. The next step is to define the type of initial activity that is to be created for the application. 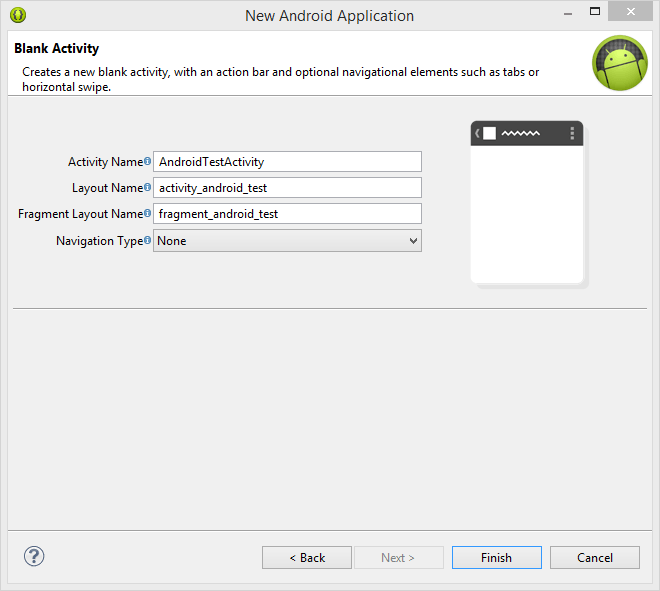 A range of different activity types is available when developing Android applications. The Master/Detail Flow option will be covered in a later chapter. 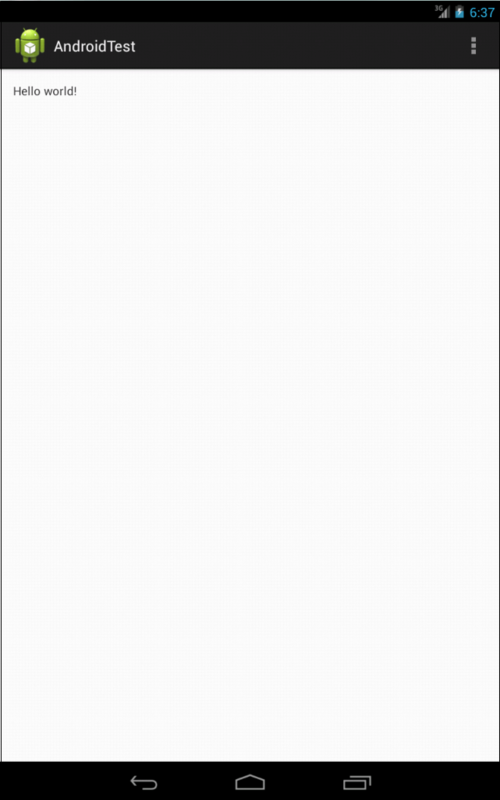 For the purposes of this example, however, simply select the option to create a BlankActivity before clicking Next >. With the Blank Activity option selected, click Next >. 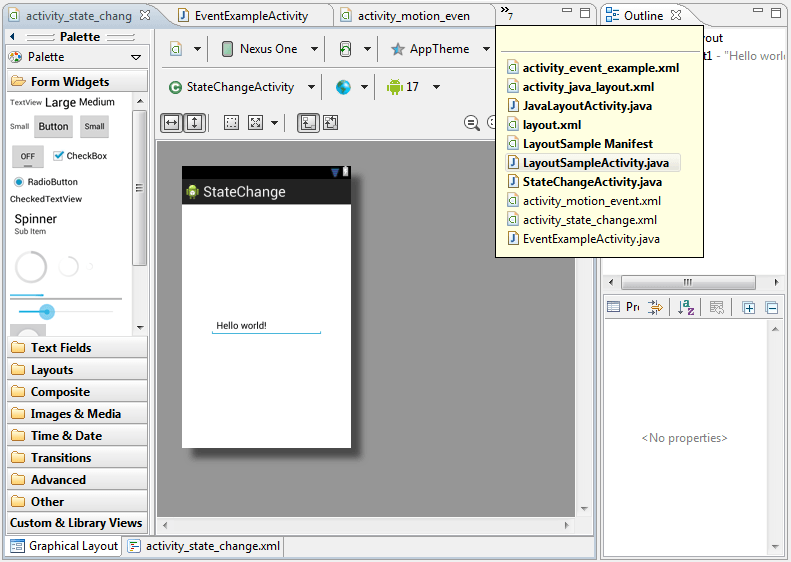 On the final screen (Figure 4 6) name the activity AndroidTestActivity. 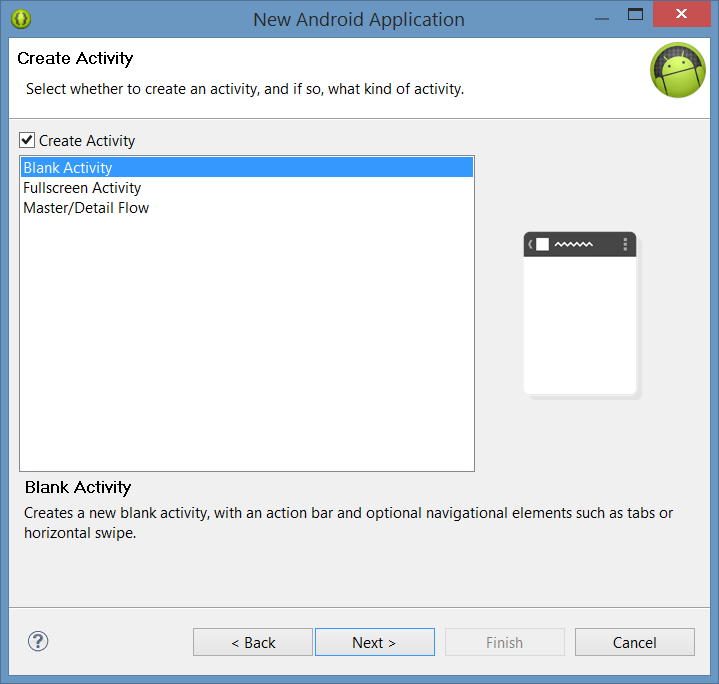 The activity will consist of a single user interface screen layout which, for the purposes of this example, should be named activity_android_test. The user interface for the activity will be contained in a fragment layout file which will be loaded when the application starts up. 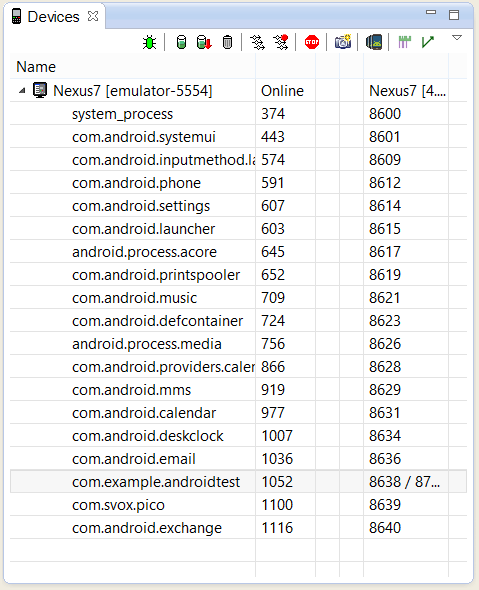 For the purposes of this example, name the Fragment Layout fragment_android_test. Finally, since this is a very simple, single screen activity, there is no need to select a navigation type, so leave this menu set to None. Finally, click on Finish to initiate the project creation process. At this point, Eclipse has created a minimal example application project and opened the main workbench screen. If the “Welcome!” panel is still displayed, close it by clicking on the “X” in the “Android IDE” tab. In the event that the activity does not automatically launch, check to see if the launch icon has appeared on the emulator screen. If it has, simply click on it to launch the application. When the application has launched, an additional window may appear asking whether or not LogCat messages should be monitored. When an application is running, a range of diagnostic messages is output by the system. In addition, the application developer may have included diagnostic messages into the application code. It is generally recommended, therefore, that monitoring of these messages be enabled. When building and running an application for testing purposes, each time a new revision of the application is compiled and run, the previous instance of the application running on the device or emulator will be terminated automatically and replaced with the new version. It is also possible to manually stop a running application from within the Eclipse environment. To stop a running application, begin by displaying the Eclipse DDMS perspective (DDMS stands for Dalvik Debug Monitor Server). The default configuration for Eclipse is to launch showing the Java perspective and for a button to be located in the top right hand corner of the main Eclipse screen (Figure 4-9) that allows the DDMS perspective to be displayed. In the event that this button is not present, the perspective may be displayed using the Window -> Open Perspective -> DDMS menu option. Once selected, the DDMS perspective will appear as illustrated in (Figure 4-10). To terminate the AndroidTest application, select the process from the list and click on the red Stop button located in the Devices panel toolbar. To return to the main Java development perspective, simply click on the Java button in the Eclipse toolbar. The next step in this tutorial is to modify the user interface of our application so that it displays a larger text view object with a different message to the one provided for us by Eclipse. 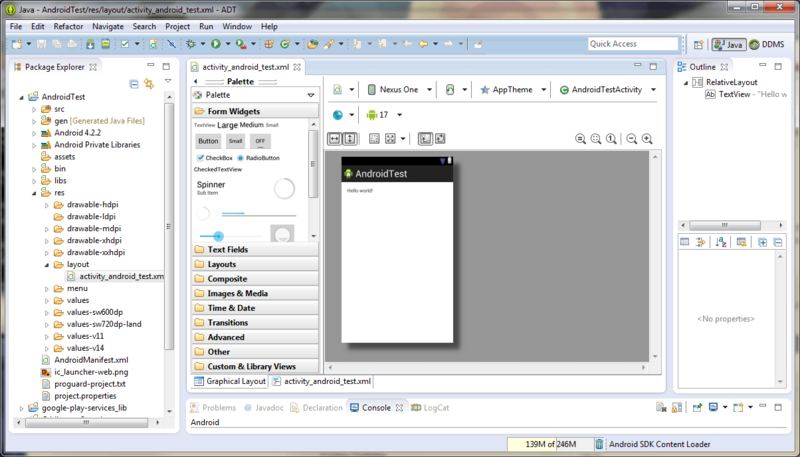 In the toolbar across the top of the layout editor panel is a menu that is currently set to Nexus One. Since we are designing a layout for the screen of a Nexus 7 device, click on the menu and select the Google -> Nexus 7 (800 x 1280: tvhdpi) menu option. The visual representation of the device screen will subsequently change to reflect the dimensions of the Nexus 7 device. If you have created a custom AVD for another device, this may also be selected from the menu so that the design canvas matches that device. To change the orientation between landscape and portrait simply use the drop down menu immediately to the right of the device selection menu. 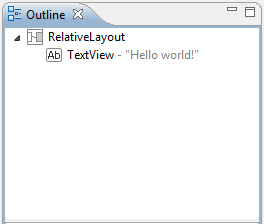 As we can see from the outline, the user interface consists of a RelativeLayout parent that has as a child the TextView object. The first step in modifying the application is to delete the TextView component from the design. Begin by clicking on the TextView object within the user interface view so that it appears with a blue border around it. Once selected, press the Delete key on the keyboard. Right-click over the TextView and select Edit Text… from the menu. When developing applications, attributes and values such as text strings should be stored in the form of resources wherever possible. Doing so enables changes to the appearance of the application to be made by modifying resource files instead of changing the application source code. This can be especially valuable when translating a user interface to a different spoken language. If all of the text in a user interface is contained in a single resource file, for example, that file can be given to a translator who will then perform the translations and return the translated file for inclusion in the application. This enables multiple languages to be targeted without the necessity for any source code changes to be made. 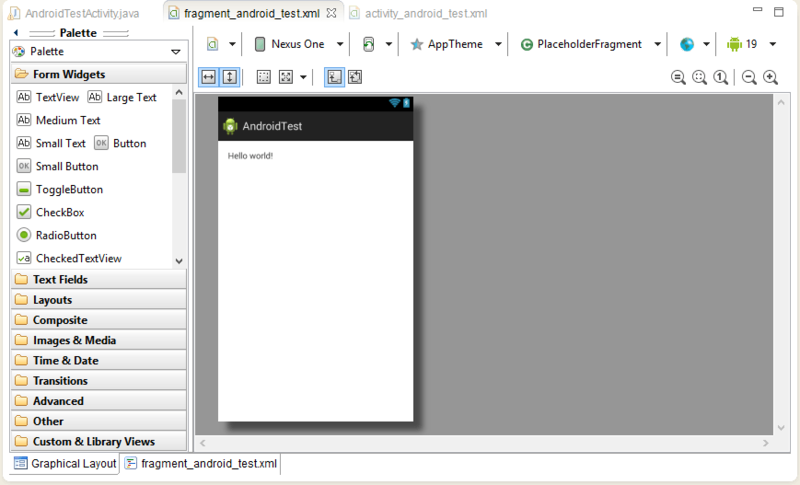 In this instance, we are going to create a new resource named welcomestring and assign the string “Welcome to Android” to it. 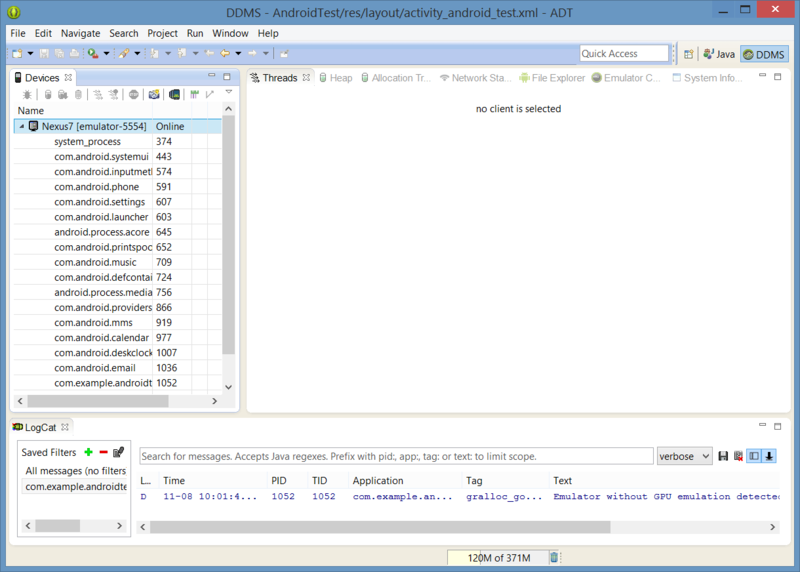 In the Resource Chooser dialog that is currently displayed, click on the New String… button and in the resulting Create New Android String dialog enter “Welcome to Android” into the String field and welcomestring into the New R.string field before clicking on OK. On returning to the Resource Chooser, make sure welcomestring is selected before clicking on OK.
Once changes have been made to a file within Eclipse, it is important to remember to save the changes before moving on to other tasks. This can be achieved by selecting the File -> Save menu option, or by using the Ctrl-S keyboard shortcut. Eclipse also allows multiple files to be open for editing simultaneously. Each open file is represented by a tab along the top edge of the editing panel. To close an open file, simply click on the X next to the file name in the corresponding tab. Double clicking on a tab will cause that editing session to expand to fill the entire Eclipse window. Double clicking a second time reverts the panel to its original size. Clicking and dragging a tab outside the Eclipse window results in the editing session for the corresponding file appearing in an entirely separate window on the desktop. Editing panels may be displayed side by side in a tiled arrangement by clicking and dragging a tab to a location to the right or left of, or above or below an existing editing panel. 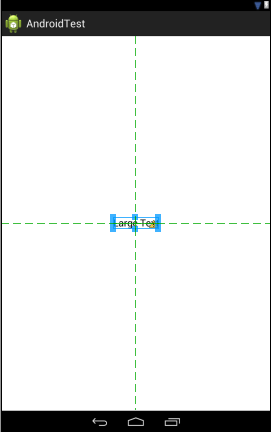 As the dragging motion approaches different locations, guidelines will appear indicating whether the editing panels will be tiled vertically or horizontally. The design is now complete so once again run the application in the emulator environment. This time the larger TextView will appear in the center of the display containing the new string resource value. As can be seen from the structure of the XML file, the user interface consists of the RelativeLayout component, which in turn, is the parent of the TextView object. We can also see that the text property of the TextView is set to our welcomestring resource. Although varying in complexity and content, all user interface layouts are structured in this hierarchical, XML based way. As a demonstration of resources in action, change the string value currently assigned to the welcomestring resource then run the application again. Note that the application has picked up the new resource value for the welcome string. Whilst not excessively complex, a number of steps are involved in setting up an Android development environment. Having performed those steps, it is worth working through a simple example to make sure the environment is correctly installed and configured. In this chapter, we have created an application and then run it within an AVD emulation session. The Eclipse Graphical Layout tool was then used to modify the user interface of the application. In so doing, we explored the importance of using resources wherever possible, particularly in the case of string values, and briefly touched on the topic of layouts. 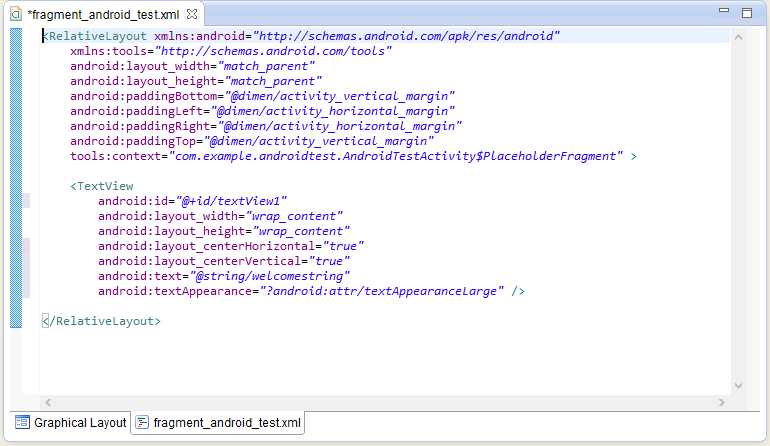 Finally, we looked at the underlying XML that is used to store the user interface designs of Android applications. Now that we have looked at running applications within an AVD emulator environment, the next chapter will cover Testing Android Applications on a Physical Android Device with ADB.